The Australian Ballet School neatly balanced classical, modern and Spanish dance, along with a healthy dose of good humour, in their highly entertaining Showcase 2018. Fulfilling the old truism if it ain’t broke, don’t fix it, the evening began with the same Grand Défilé as Showcase 2017. 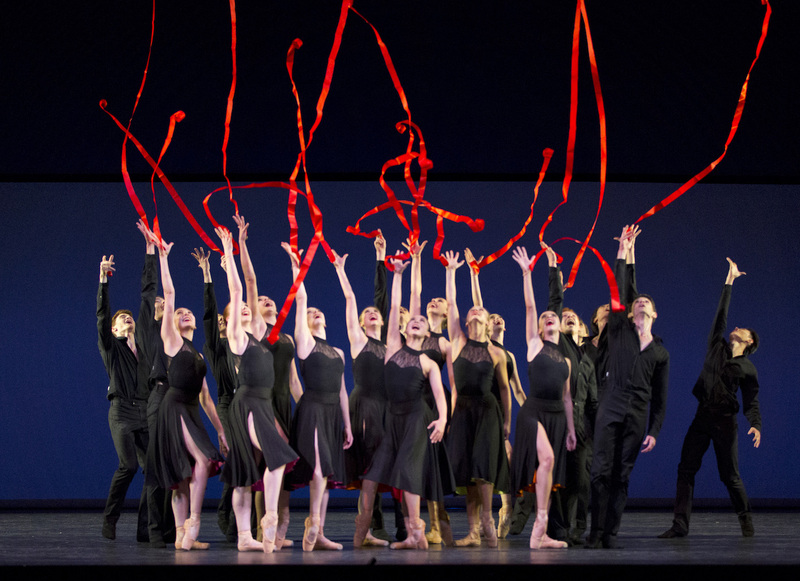 Paul Knobloch’s grand parade again drew instant applause as the curtain rose to show the 121 dancers of The Australian Ballet School in spectacular formation. Dressed all in white, against a black box background, the dancers moved with precision, poise and purpose. 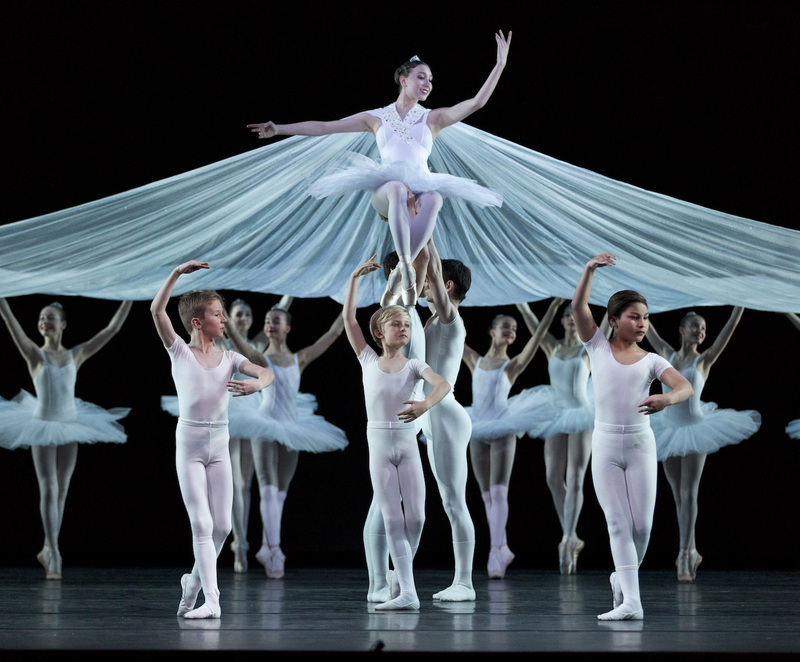 While the juxtaposition of 121 swiftly moving bodies is its own attraction, a particular highlight of the piece saw a girl in a white massive cape lifted overhead as dancers moved under the canopy of lace, creating a striking visual image to accompany the wonderful dance. The evening’s only piece that was accompanied by live music, Areti Boyaci’s Alegrías showcased the skill and focus of 14 of the graduating Level 8 students. Performing to an arrangement of guitar and vocals, the dancers moved in crisp, tight unison whilst also projecting plenty of characterful presence. Girls wore white bolero jackets over red ruffled dresses while the boys sported a relaxed look of black suit and white open necked shirt to striking effect. Originally choreographed by Mark Annear for the school’s 40th Anniversary Gala in 2004, Waltz from Birthday Celebration gave younger students a chance to shine in traditional ballet choreography. Dressed all in white, with extra sparkle on the girls, the 21 dancers showed a level of polish and accuracy that portends most favourably for the future of classical dance. Annear’s use of symmetry was expertly realised by the young dancers. 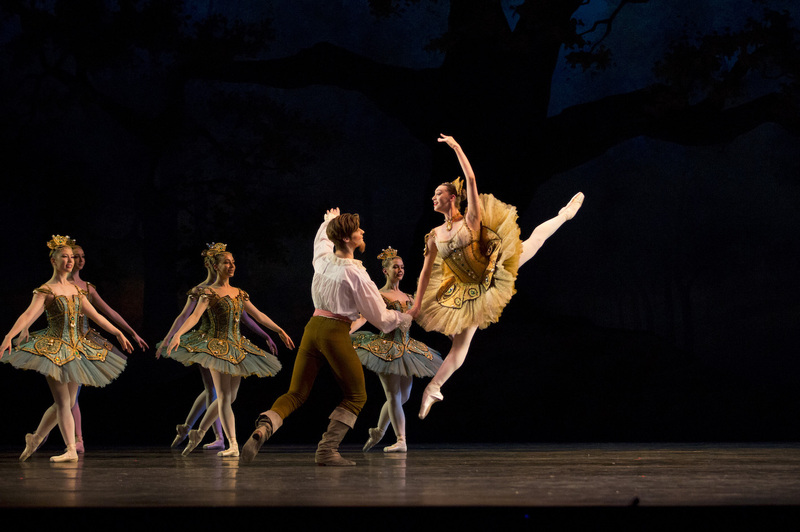 The evening’s featured classical work was an excerpt from Act II of Don Quixote, in which the wounded knight imagines a garden of dryads and flowers. While little dancing was required of Nicholas Harper as Don Quixote, he maintained the dreamlike state of the knight with charming stage presence. 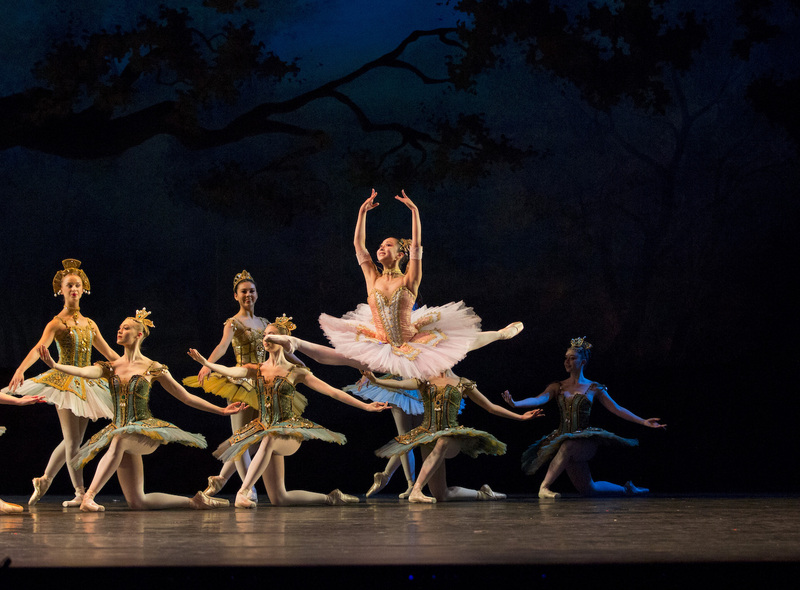 In a work that was a significant showcase for the female dancers, the three featured performers in the Don Quixote excerpt stood out: Kaho Kato danced with serene presence as fair Dulcinea; Sydney Merrilees delivered the loveliest of lines as Queen of the Dryads; Jasmin Forner beamed with a radiant smile as Cupid. In a truly delightful world premiere, Simon Dow choreographed the eight dancers of Level 4 in Wolfgang Dance, set to the well-known first movement from Mozart’s Eine Kleine Nachtsmusik. Wearing powdered white wigs, the sassy dancers bounced and flounced in sharp time to the music, drawing many appreciative laughs from the audience. Dow gave the dancers a very cute running action, and there was even some vocalisation from the three boys. The first half concluded with a very welcome revival of Valetta, created by Paul Knobloch in honour of his grandmother in 2007. Serving as a complementary piece to the excerpt from Don Quixote, gender proportions were reversed in Valetta, in which one female dancer performed with 15 boys. 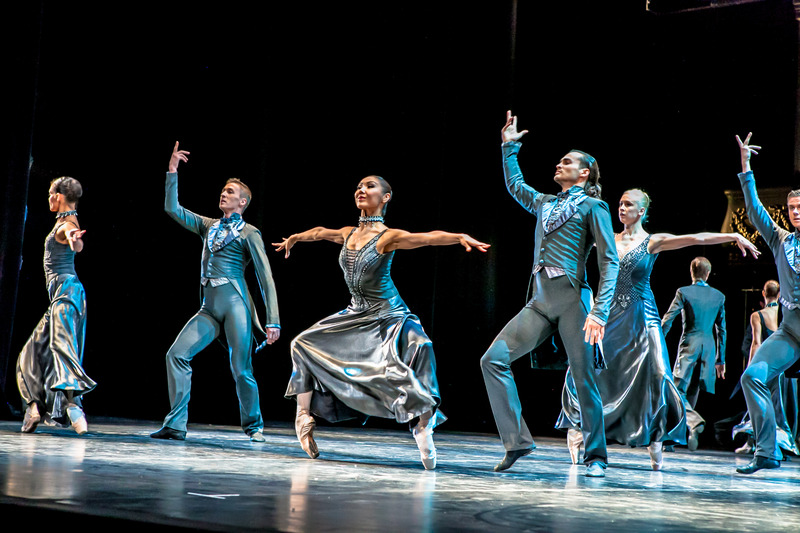 Making gorgeous use of modern dance, with just a hint of classical influence, the sweeping piece filled the stage with dynamism and a sense of old world romance. 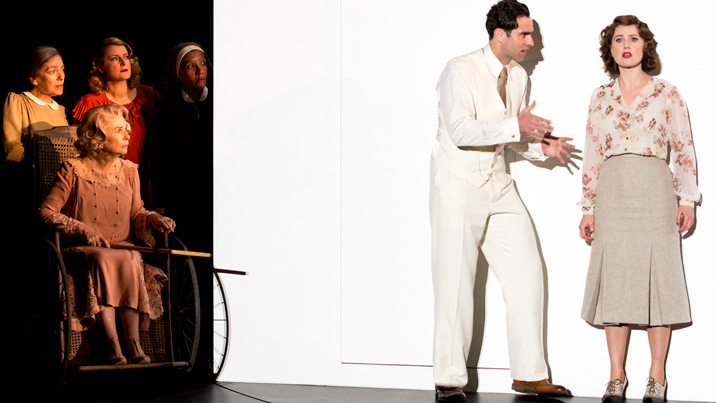 Kaho Kato gave a wonderfully characterful performance as the lone Girl, expertly supported by magnetic dancer Clayton Forsyth as Principal Boy. The second half of the program featured no less than three further world premieres, reflecting the level of innovation and imagination at the School. 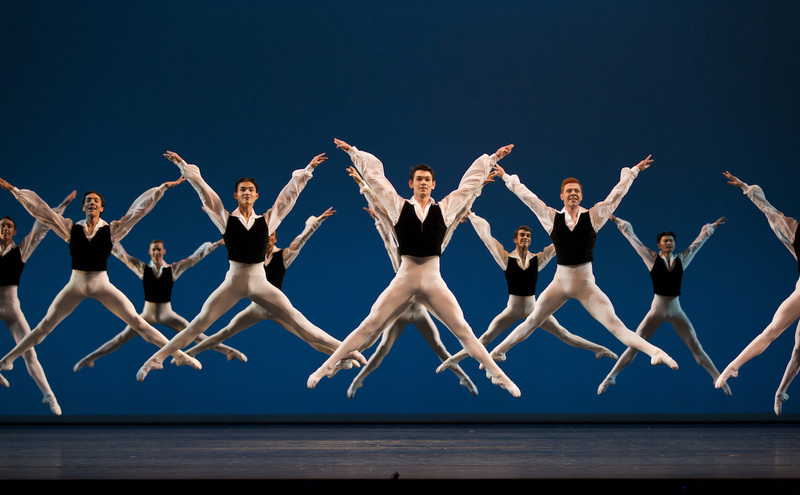 Stephen Baynes, resident choreographer of The Australian Ballet, created Ballo Barocco, a work that would be a solid fit for The Australian Ballet’s current style of modern mixed programs. Dressed somewhat androgynously, but nonetheless distinctively, in black, 16 very well rehearsed dancers from Level 7 performed with flair, passion and vitality. Set to music by Bach, the piece featured a first and third movement characterised by plaintive longing, while the second and fourth movements had a lively air of vivaciousness. A dynamic massed finale bought the piece to a striking conclusion. Perfectly pitched to the age group of the dancers, Heart Strings was a delectably amusing new work by Margaret Wilson. A riff on teen politics, schoolyard power plays and young love, Heart Strings was as amusing as it was spectacular. The piece began in an unusual way, with the dancers standing in silent formation with their backs to the audience. Girls wore powder blue outfits, with their hair hanging freely in ponytails. Wilson was inspired to give the boys particularly exciting, highly physical choreography that involved formation of fascinating patterns. The work brought out not just the dancing talent of the cast but also their stage charisma and personalities. Simon Dow drew on tango traditions to choreograph Danza de la Vida, a fitting finale for the senior students. Beginning with a sense of West Side Story’s “Dance at the Gym,” sets of male and female dancers circled each other warily before beginning to dance. Dressed in black, flashes of colour were provided by neon fabric on the underside of the girls’ skirts. Hayley Thomson and Clayton Forsyth performed an electric, passionate final pas de deux before the full cast returned to the boys versus girls theme for a stirring finale. A treasured fixture on Melbourne’s dance calendar, The Australian Ballet School’s annual Showcase continues to be as inspiring and heartening as it is downright entertaining. The Australian Ballet School: Showcase 2018 played at State Theatre, Arts Centre Melbourne, 7.30pm Sunday 9 September 2018. Showcase 2018 plays at Canberra Theatre Centre, Saturday 22 September 2018. Looks and sounds great Simon…..must put it on the calendar for next year . The Showcase always coincides with the Australian Ballet Melbourne season as they let the School use the theatre on one of the free nights. 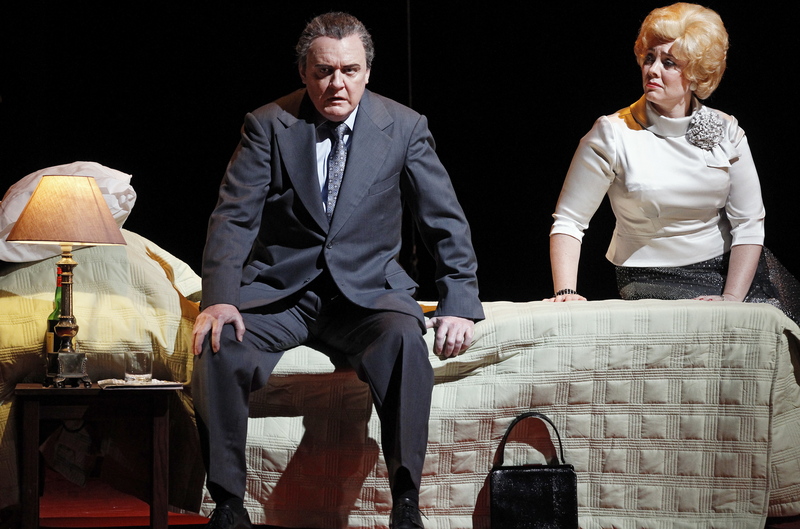 You could be well served by catching two performances with one trip.